Easily reached from Interstates 76 77 and Rt. 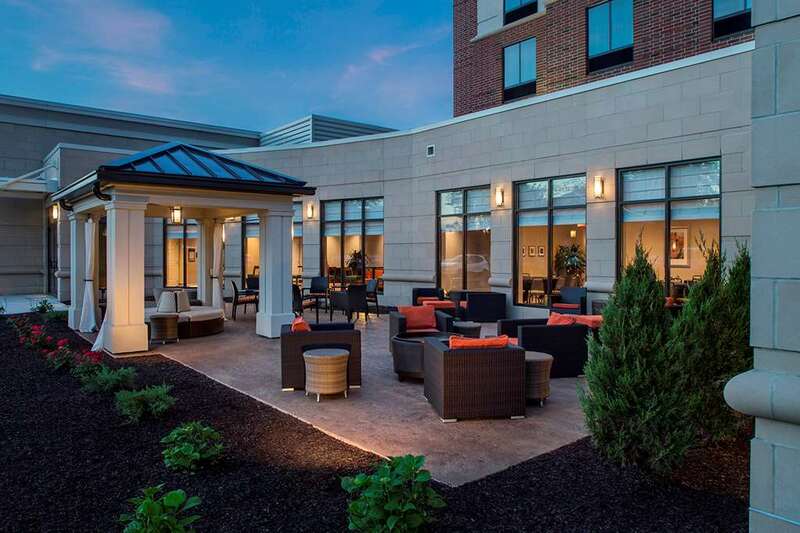 8 the Hilton Garden Inn Akron Ohio hotel is just 15 minutes* drive from Akron/Canton Regional Airport and a short 35 minute drive to downtown Cleveland. An ideal base for business and leisure travelers the hotel is only minutes from Akron*s city center and is conveniently close to the University of Akron the Goodyear World Headquarters the Canal Park Stadium Akron Children*s Hospital Akron General Hospital and Summa Health System. Take advantage of our complimentary shuttle service to many downtown companies restaurants and Akron OH attractions including The Akron Zoo and The Akron Art Museum. Warm and welcoming the guest rooms at this Akron OH hotel feature a variety of modern amenities to help you relax and stay productive. Work in comfort at the ergonomic desk and stay connected with complimentary WiFi. Watch premium channels on the HDTV or play your favorite music through the alarm clock with MP3 jack. Chill drinks in the mini-refrigerator and heat up late night snacks in the microwave. Enjoy useful services like faxing and printing in the complimentary 24-hour business center. Plan a meeting training event or wedding at this hotel in Akron OH with two boardrooms a flexible 3 700 sq. ft. ballroom and contemporary audio/visual technology. Work out in the hotel*s complimentary fitness center swim in the sparkling indoor pool or relax in the whirlpool. Stock up on snacks and sundries in the onsite 24-hour Pavilion Pantry. Unwind with a drink in the welcoming Garden Grille - Bar which serves American cuisine for breakfast lunch and dinner. The Garden Grille - Bar: Our on-site restaurant provides a freshly prepared breakfast daily offering breakfast buffet and a la carte items. The restaurant also serves dinner daily.